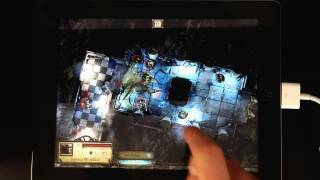 Gameplay footage of Warhammer Quest for iOS. Finish the game on Adventure. Have an Archmage reach Level 6. Have a Grey Wizard reach Level 6. Kill a boss in one hit. Dungeon Adventures in the Warhammer World! Lead your group of brave adventurers through the perilous dungeons of the Warhammer world in the search for wealth and glory! Based on the classic Games Workshop board game, Warhammer Quest is a mix of adventure, strategy and role-playing. Games Workshop's Warhammer board game finally makes it onto a handheld device, but can the transition from a board game to small screen touch screen game work?